It is increasingly clear that a major cause of human genetic abnormalities is dysregulation of genes, and often multigenic in origin. Mutation of cis-regulatory modules (CRMs) that interact with transcription factors (TFs) has emerged as a pervasive cause of human disease. Importantly TFs do not function in isolation or in linear pathways, but rather interact in complex webs or networks. Each developmental decision involves a large number of orchestrated transcriptional changes in batteries of cell-type-specific genes under the influence of multiple intercellular signaling pathways, all within the spatial complexities of morphogenesis. In addition epigenetics and chromatin structure profoundly influence the global accessibility of CRMs to TF binding but how this impacts cell fate decisions is poorly understood. 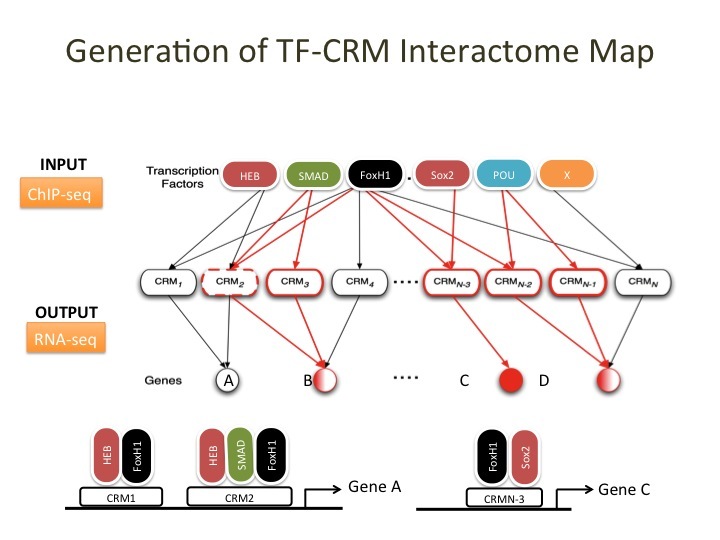 Thus understanding how the genomic blueprint controls cellular phenotypes in development requires the integration of TF-CRM interactions on a genome scale together with molecular details at the single gene level, for every gene in a living embryo; in short a complete GRN. Ultimately, a GRN would not only contain a molecular parts list and reflect the network architecture, but would also provide phenotypic insights. Understanding network architecture would enable identification of components that, when mutated, cause significant phenotypic changes, which has disease implications. We apply a quantitative method to determine global transcript kinetics, analyze multi-dimensional data sets originating from RNA-seq, ChIP-seq and DNase-seq, and perform computational network modeling methods to infer the detailed architecture of the endoderm GRN. Blitz IL, Paraiso KD, Patrushev I, Chiu WT, Cho KW, Gilchrist MJ. (2016). A catalog of Xenopus tropicalis transcription factors and their regional expression in the early gastrula stage embryo. Blitz IL, Paraiso KD, Patrushev I, Chiu WT, Cho KW*, Gilchrist MJ*. *equally senior authors. Owens, N.D.L. 1, Blitz, I.L. 1, Lane, M.A., Overton, J.D., Gilchrist, M.J#, Cho, K.W.Y#., Khokha, M.K. # (2016). Embryogenesis kinetics measured by high-resolution absolute quantitation of transcripts. Submitted. 1: co-first authros, contributed equally. Cell Reports. 14, 632-647. #equally senior authors. FoxH1 binding is dynamic and bookmarks endodermal genes before noticeable histone modifications. A central question in biology is to understand how the naive genome in the early embryo progressively undergoes a series of modifications to control gene expression in “time and space” such that proper cellular differentiation programs are correctly implemented. The project focuses on the underlying activity of Foxh1 transcription factor by addressing causal-relationships between Foxh1 and epigenetics by deeply investigating the dynamic activity changes occurring during early embryogenesis. Our results will be data-rich, cutting-edge and transformative, as it will influence our understanding of pioneer factors in relation to cellular competence, the maternal-zygotic transition and germ layer specification. Charney, M.R., Forouzmand, E., Cho, J.S. Cheung, J., Paraiso, K. D., Yasuoka, Y., Takahashi, S., Taira, M., Blitz, I.L., Xie, Cho, K.W.Y. (2017). 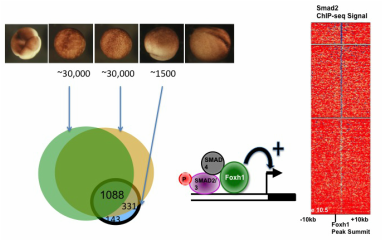 Foxh1 bookmarks cis-regulatory modules to coordinate dynamic transcription factor interactions controlling the mesendoderm gene program. Dev Cell, In press. ​Chiu, WT., Le, R., Li, Y., Beisinger, J., Blitz, IL., Xie, X., and Cho,, KWY. (2014). Comprehensive genomic view of FoxH1 and Smad2/3 interaction in mesendoderm development. Development, 141:4537-47. PMID: 25359723. Blitz, IL., Fish, MB., Cho, KWY. (2016). 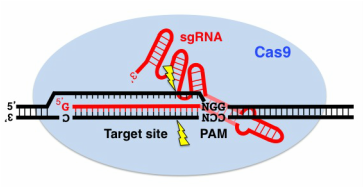 Leapfrogging: primordial germ cell transplantation permits recovery of CRISPR/Cas9-induced mutations in essential genes. Development. 143(15):2868-75. Blitz,IL., Biesinger, J., Xie, X., and Cho, KWY. (2013). Biallelic Genome Modification in F0 Xenopus tropicalis Embryos Using the CRISPR/Cas System. Genesis, 51:827-34. Nakayama, T., Blitz I.L., Fish, M.B., Sumanth, A., Cho, K.W.Y., Grainger R. (2014). Cas9-based genome editing in Xenopus tropicalis. In: Jennifer A. Doudna and Erik J. Sontheimer, editors, Methods in Enzymology, Vol. 546: 355-75 Burlington: Academic Press. Phasor map of various metabolites in mouse embryos. It is estimated that more than 5 million babies have been born worldwide since the first IVF baby was born in 1978. Significant improvements in ovulation induction and oocyte retrieval, and in vitro culture techniques now provide the opportunity for the physicians to choose “healthy” embryos for uterine transfer. Yet, it is surprising that there is little progress in the approaches to assess the quality of preimplantation embryos. The current procedure used in IVF clinics still heavily relies on rigorous morphological classification by microscopic examination. Current means for assessing embryo quality and viability can be further improved. Here we describe the application of a “non-invasive” live imaging approach capable of measuring endogenous autofluorescent metabolites within living mouse embryos undergoing in vitro culturing. We apply a phasor-FLIM (Fluorescence-Lifetime Imaging Microscopy) approach and capture information on the metabolic energy sources utilized by pre-implantation embryos as readout of embryo quality and viability. Recent advancements have made it possible to culture human embryos for in vitro fertilization to a stage where cell biopsy is possible, which presents great opportunities to perform genetic testing and improve clinical outcomes. Better understanding of how the early mammalian embryo organizes itself and responds to interventions is required to determine how such testing itself influences development, a tall order given experimental difficulties and ethical concerns. This project will combine modeling and experimentation to develop a state of the art, stochastic modeling platform that 1) describes developmental processes occurring on a range of different biological scales, 2) incorporates data on both mouse and human development, 3) and can be used to predict the outcome of physical and chemical manipulations of the embryo. Chiang, M., Hallman, S., Cinquin, A., Reyes de Mochel, N., Paz, A., Kawauchi, S., Calof, A., Cho, KWY., Fowlkes, C.C., & Cinquin, O. (2015). Analysis of in vivo single cell behavior by high throughput, human-in-the-loop segmentation of three-dimensional images. In press. BMC Bioinformatics. DOI 10.1186/s12859-015-0814-7. Reyes de Mochel, NS., Luong, M., Chiang, M., Javier, A.L., Luu, E., Cinquin, O., and Cho, KWY. (2015). BMP signaling regulates both cell proliferation and ICM lineage commitment in preimplantation-stage mouse embryos. Dev Biol. 397: 45-55. LncRNA is defined as being longer than 200 nucleotides in length, polyadenylated or non-polyadenylated, transcribed by RNA polymerase II, and marked with epigenetic modifications typical of protein coding genes, While different classes of regulatory lncRNAs with important functions are starting to emerge, the functions of >99% of lncRNAs remain elusive. Understanding the significance of lncRNAs is an important challenge facing biology today. Currently, there is no universal experimental approach to characterize functional contributions of individual lncRNAs, owing both to the complexities of transcriptional regulation and the diversity of subcellular functions that can be attributed to each lncRNA. Our goal is to characterize these lncRNAs to uncover their functions. Forouzmand E, Owens ND, Blitz IL, Paraiso KD, Khokha MK, Gilchrist MJ, Xie X, Cho KWY. (2016). Developmentally regulated long non-coding RNAs in Xenopus tropicalis. Dev Biol. S0012-1606(16)30120-8.